An organic alkalising, cleansing and detox formula, which combines the best of nutrient-dense foods from both the sea and Earth’s soil. The ingredients that have been blended in these capsules include: Seagreens® food approved seaweed (Ascophyllum nodosum and Fucus vesiculosus), artichoke, chlorella, green tea leaf, spirulina, rhubarb and cayenne. This supplement provides a unique blend of nutritious foods, rich in a broad spectrum of nutrients such as iodine, antioxidants, phyto-chemicals, vitamins, minerals and enzymes. general nourishment, great health and vitality. Click here for iodine EFSA authorised health claims. 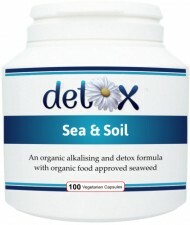 The herbs used in this food product are grown to the highest certified organic standards.